Year 1876 (MDCCCLXXVI) was a leap year starting on Saturday (link will display the full calendar) of the Gregorian Calendar (or a leap year starting on Thursday of the 12-day slower Julian calendar). February 2 - The National League of Professional Baseball Clubs of Major League Baseball is formed. February 3 - Paraguay makes peace with Argentina after the War of the Triple Alliance. February 15 - Texas ratifies its current constitution. February 22 - Johns Hopkins University founded in Baltimore. March 7 - Alexander Graham Bell is granted a patent for an invention he calls the telephone (patent # 174,465). March 10 - Alexander Graham Bell makes the first successful telephone call by saying "Mr. Watson, come here, I want you." April 16 - Bulgarian April uprising. April 17 - Six Fenian prisoners escape from a penal colony in Fremantle, Australia with the aid of ship Catalpa. May 1 - The Settle to Carlisle Railway in England is opened to passenger traffic. May 10 - The Centennial Exposition begins in Philadelphia, Pennsylvania. May 11 - May 12 - Berlin Memorandum - Germany, Russia and Austria-Hungary propose an armistice between Turkey and its insurgents. May 16 - British prime minister Benjamin Disraeli rejects Berlin Memorandum. May 18 - Wyatt Earp starts work in Dodge City, serving under Marshal Larry Deger. June 4 - An express train called the Transcontinental Express arrives in San Francisco via the First Transcontinental Railroad only 83 hours and 39 minutes after having left New York City. June 17 - Indian Wars: Battle of the Rosebud - 1,500 Sioux and Cheyenne led by Crazy Horse beat back General George Crook forces at Rosebud Creek in Montana Territory. June 25 - Indian Wars: Battle of the Little Bighorn. Lieutenant colonel George Armstrong Custer of the US 7th Cavalry Regiment leads a unit of 300 men in battle against the allied forces of Lakota, Cheyenne and Arapaho, counting 5000 men under the leadership of Sitting Bull and Crazy Horse. The latter emerge victorious. Punch cartoon from June 17. 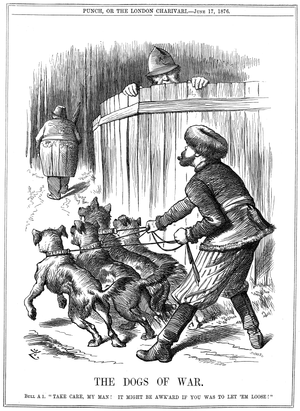 Russia preparing to let slip the Balkan "Dogs of War" to attack Turkey, while policeman John Bull (Britain) warns Russia to take care. The Balkans would attack Turkey two weeks later. July 1 - Serbia declares war on Turkey. July 2 - Montenegro declares war on Turkey. July 4 - The United States celebrates its centennial. July 8 - Reichstadt Agreement between Russia and Austria-Hungary on partitioning the Balkan peninsula. July 13 - The prosecution of Arthur Tooth, an Anglican clergyman, for using ritualist practices begins. August 1 - Colorado is admitted as the 38th U.S. state. August 8 - Thomas Edison receives a patent for his mimeograph. August 31 - Murat V, sultan of the Ottoman Empire is deposed and succeeded by his brother Abdul Hamid II. September 5 - Gladstone publishes Bulgarian Horrors pamphlet. September 7 - In Northfield, Jesse James and the James-Younger Gang attempt to rob the town's bank but are surrounded by an angry mob and are nearly wiped out. October 4 - Texas A&M University, opened for classes. October 31 - Catastrophic cyclone strikes the east coast of India. 200,000 people lose their lives. November 7 - The U.S. presidential election is held. After long and heated disputes, Rutherford Birchard Hayes would be declared the winner over Samuel Jones Tilden. November 10 - The Centennial Exposition ends in Philadelphia, Pennsylvania. November 23 - Corrupt Tammany Hall leader William Marcy Tweed (better known as Boss Tweed) is delivered to authorities in New York City after being captured in Spain. November 25 - Indian Wars: In retaliation for the dramatic American defeat at the Battle of the Little Bighorn, United States Army troops under General Ranald S. Mackenzie sack Chief Dull Knife's sleeping Cheyenne village at the headwaters of the Powder River (the soldiers destroyed all of the villager's winter food and clothing and then slashed their ponies' throats). November 29 - Porfirio Díaz becomes President of Mexico. December 5 - A Brooklyn theater fire kills more than 300. December 6 - The first cremation in the United States took place in a crematory built by Francis Julius LeMoyne. December 29 - Ashtabula River Railroad bridge disaster occurs, leaving 92 dead. Charles Wells opens his brewery based in Bedford, England. Construction of Spandau Prison completed. Invention of the four-stroke cycle internal combustion engine by Nikolaus Otto. Samurai are banned from carrying swords in Japan. The Conchological Society of Great Britain & Ireland founded. Lars Magnus Ericsson and Carl Johan Andersson start a small mechanical workshop in Stockholm, Sweden, dealing with telegraphy equipment, which grows into the world-wide company Ericsson. Friends Academy is founded by Gideon Frost. Sports club Associação Académica de Coimbra - O.A.F. was founded. Port Vale Football Club was formed. Stourbridge Football Club was formed. The Adventures of Tom Sawyer was published. 229 people were married in 1876. There were 0 military battles in 1876. This page uses content from the English language Wikipedia. The original content was at 1876. The list of authors can be seen in the page history. As with this Familypedia wiki, the content of Wikipedia is available under the Creative Commons License.